IR used to defeat CCTV | Where is Your Data? We are repeatedly told the CCTV is here to protect us from the worst of the worlds offenders, including terrorists and international criminals. Despite the obvious flaw in the argument that suicide bombers are not bothered if they are filmed blowing themselves up (especially as they normally release videos to that effect shortly afterwards anway), there is the additional issue that if a person wants to hide their face from a standard CCTV camera it is incredibly easy. A person can hide their face with a beard, material (mask/bandanna/etc), or they can go slightly more high tech and use infrared lights. 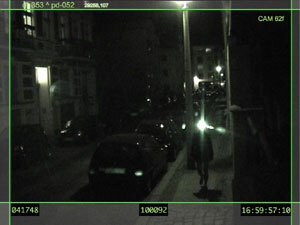 A single point source of a IR Laser, if pointed directly at CCTV camera will flare the camera, however that involves a laser and the user to point and hold the laser directly at the camera. However, if the individual uses and array of IR LEDs then the effect is the same, as a single directed laser. 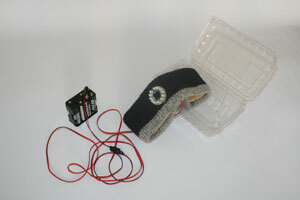 The idea is relatively simple, the user places IR LEDs in a “head torch, such as the one pictured inset. IR LEDS can be bought for just 79p and LED head torches can be bought for just under £5 . 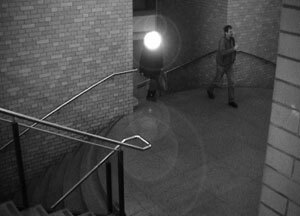 IR – Infrared – with a range of 750nm to 1mm has a range below the human eye, but can still be detected by CCTV cameras. Below are the effects of using this type of technology. There are flaw in this anti-CCTV devices. The LEDs need to be powerful enough, the and CCTV camera needs to not have an IR filter. It is is also possible, to enhance the blue green specturm after the incident to try and recover a better image.